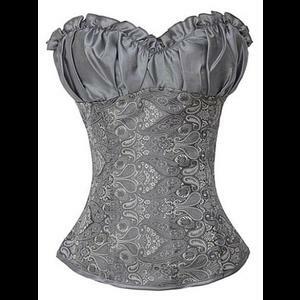 A gorgeous pastel goth Victorian boned corset with a silver grey satin gathered and lightly padded upper bodice and a shimmery silver grey paisley damask design on the lower section. The corset hs a side zip fastening as well as adjustable metal eyelet and grey satin ribbon lacing at the back. The corset comes with optinal shoulder straps. Perfect if going for the Miss Havisham ghostly look!